Life sciences companies need to make better use of the insights that real-world data (RWD) can provide in order to improve market access, sales and market growth strategies – and ultimately to improve the applicability of new and existing therapeutics for patients. Insights come not just from the multiple sources of RWD available, but from advanced analytics that highlight the effectiveness of a treatment by geographic area, and link healthcare providers, institutions and patients to relevant and meaningful outcomes. This one-hour webinar takes a hands-on approach – detailing how insights derived from RWD (and collaboratively with other sources) are enabling all elements of the life science industry to do things better. 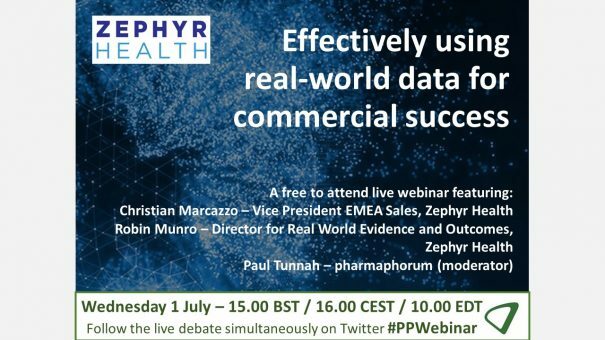 The webinar also gives an exclusive look at what can be achieved from combining data sources – using Diabetes in England as a case study, Zephyr has implemented novel methods to demonstrate an evidence-based approach to improving information sharing within sales teams and to engaging accounts and payers. We explore how patient outcomes from RWD can add value to commercial strategy. In this presentation we discuss how to overcome the challenges presented by RWD and show how it is possible for payers, providers and pharma to start to link insights to their respective strategies and drive improvement in patient outcomes. There is an overwhelming amount of data across the public domain, including within hospitals and other registries, which needs to be accessed, managed and analysed. As this data becomes more and more widespread, so too does the level of complexity in accessing and analysing it for life science companies. This webinar will reveal how to approach and overcome some of these complexities. The live broadcast took place on Wednesday 1 July at 15.00 BST / 16.00 CEST / 10.00 EDT. To view the on-demand version please click here or on the webinar widget below. Robin is currently focused on enhancing Zephyr’s capabilities to take advantage of the wealth of available public health data to drive better evidence and outcomes for Life Science businesses. Robin has 20 years of experience in Bioinformatics and Medical Informatics. He has led teams to develop genomics software solutions, specializing in Translational Medicine for both Pharmaceutical and Healthcare scientists. Prior to Zephyr Health he worked for software vendors LION bioscience and InforSense. He also served as a Director at IDBS where he led the Translational Science team.